Earlier this month DigitalGlobe's WorldView-3 satellite successfully launched and now we are getting our first look at some of the images. As you can see in the images below its fairly easy to pick up on particular vehicles and landmarks. The WorldView-3, is capable of taking images at double the resolution of Google Maps, according to the company, but is still limited by government restrictions. It has initially been snapping shots over Madrid that have been resampled down to 40 cm to meet the limitations. The satellite is capable of 30 cm images or better, which is drastically more detailed, but we will have to wait for restrictions to be lifted before we can catch a glimpse of them. Either way, the 6200 pound, 18-foot tall satellite's images look fairly impressive so far. You can download the full resolution 40 cm images on the official DigitalGlobe site. Due to DigitalGlobe being so firmly planted in the commercial satellite imaging space, it has managed to get the resolution restrictions lifted, but it won't be until February until that content becomes available to its clients. 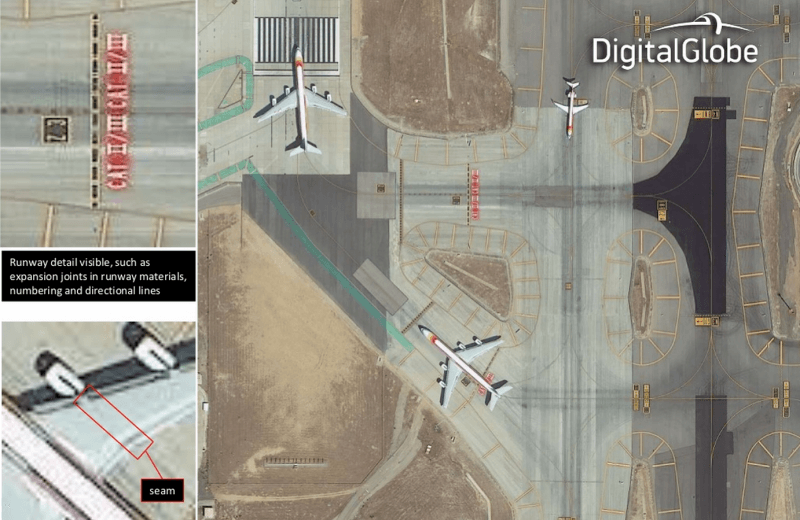 DigitalGlobe says the satellite images could help companies and even governments to monitor the progress of various city development projects among a wide range of other things.